There is something glorious about Furious 7. It has a surplus of energy, simply bursting off the screen with its patented formula of hyper-masculine melodrama. What really makes it work is the fact that its characters have emotions as oversized as their ludicrous automotive stunts. It isn’t just the action that is over the top. Furious 7 is a wonderful repudiation of the idea that realism, in and of itself, is somehow a virtue. Furious 7 does not reflect life, it amplifies it. I have to say that I am not an expert on this series of films. I saw the first two in high school and more or less enjoyed them, though they were quite forgettable. When the third jettisoned the whole cast to jump to Japan, I tuned out completely. Even bringing in the The Rock, who I will gladly watch in just about anything, couldn’t really get my attention enough to get me to the theater. (After seeing Furious 7, I picked up a copy of Fast 5 and now know what a fool I’ve been.) On the back of conflicting buzz about this seventh installment, I heard some wildly differing opinions about its quality going in, I took a chance and caught Furious 7 on a slow Saturday afternoon and was blown away. 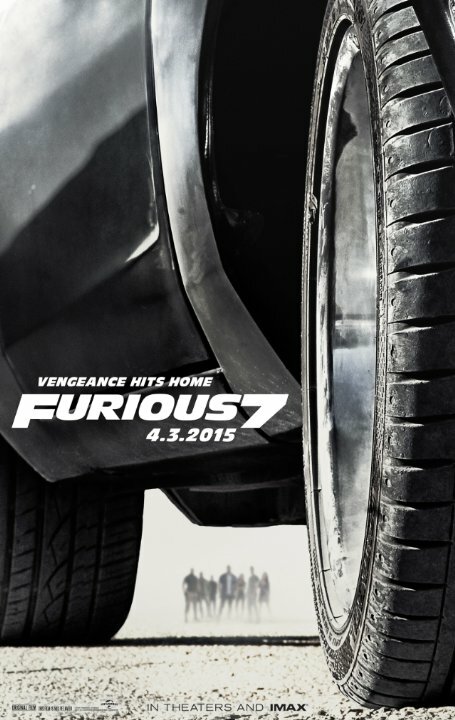 Furious 7 uses “over-the-top” as the starting place for its action scenes and goes from there. Co-protagonist Brian tells his young son early on that cars don’t fly and the movie spends the rest of its runtime proving this to be false. In the world of Furious 7 car do fly, or at least fall with style. Physics in this movie are not the same as they are in the real world. And why should they be? Why should film be constrained by life’s limits? At least twice does Dom (Vin Diesel) get into a head on collision only to get out of his car, unharmed, and get into a fistfight. A highway hijacking is old hat, here they parachute their cars down onto the road before getting down to business. Police chase? Forget that. Instead, a chase involving an attack drone tearing up the streets of Los Angeles? Somehow, the movie keeps finding ways to up the ante, even though they went all in right from the start. By the time The Rock flexes his broken arm out of its cast and pick up a fallen Gatling gun to shoot at a helicopter it seems positively routine. Just doing spectacle well is not enough for a movie to stand out. Everyone does spectacle now, but it is rare to see it done with any sort of coherent base underneath it. It all works in Furious 7 because it is built off emotions that, while not complex, are all but universal. Furious 7 is about family and love and revenge. Not anything new to film, but holding any sort of theme together seems to be beyond the ability of most blockbuster franchises (this is my required middle finger to the highly profitable dreck that is Transformers). For seven movies now, with some stops and starts, this franchise has been building the idea that Dom and his gang are a family. Some of that is literal, with his sister Mia and her husband Brian, some is more metaphorical. For Dom, there is nothing he won’t do for his family. That is mirrored in the villain, Deckard Shaw, who is after them in revenge for what they did to his brother. What his brother might have done is immaterial, they are family and no one messes with his family. That leads him to starting a war with Dom and the rest of the good guys, who have no choice but to respond in turn. The motivations of the good guys does get a little muddled in the middle, going on a globetrotting adventure to get a computer program that will let them track Shaw so he can’t catch them by surprise, but it all comes down to them fighting for their families. The thing it, Furious 7 knows how ridiculous it is. It wants to viewers to laugh as cars parachute out of airplane or Kurt Russell puts on a pair of night-vision sunglasses in the middle of gunfight and goes to town. It wants the viewers’ hearts in their throats as it does its slightly overused camera roll as the people flip during fights. It wants tears in the viewers’ eyes as Brian (the late Paul Walker) drives off to Valhalla at the end of the film. This is a movie with emotions as over the top as the action and if you let yourself get caught up just a little, it will take you for a ride. This is what spectacle driven films should strive to be.